Arrangement of Silk Roses with mini silk flowers in Wooden Vase. Gift your home that much needed exclusivity with this flower vase that will uplift its look by notches. 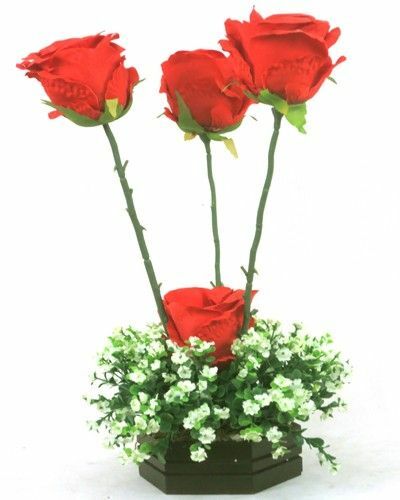 Crafted in imported wooden vase with red silk roses and soft white silk mini flowers that will catch everyone's eye with its charm and elegance. A great utility product, this one is a must buy. Color : Green, Red, Pink, White, Black, Blue, Brown Material : Synthetic Cloths, Metal, Wood, PVC, Rubber Product Dimensions (LxBxH) : 14"x6"x6"